Interesting speakers. Continuing Education. Networking. Happy Hours. Those may be a few of the many benefits you provide your members. And, you may think those are the ones they really want. But are you sure? If you’re continually hearing from members that they’re too busy to attend events or volunteer, there’s a good chance they’re not getting what they want and need. What is it they really want from the chapter? Is it career progression? Education? A chance to socialize? Is it possible that what they want isn’t the benefit itself but those tangible and intangible elements the benefit provides? Hark back to your college psychology or sociology class - remember Maslow’s Hierarchy of Needs? Maslow grouped human needs into five areas of increasing importance, from basic physiological requirements like food, water and sleep, to complex self-actualization ones, such as utilizing abilities and talents, pursuing a goal and seeking happiness. Maslow also said that to achieve the more complex needs, we have to work our way up, and get the basic ones first. 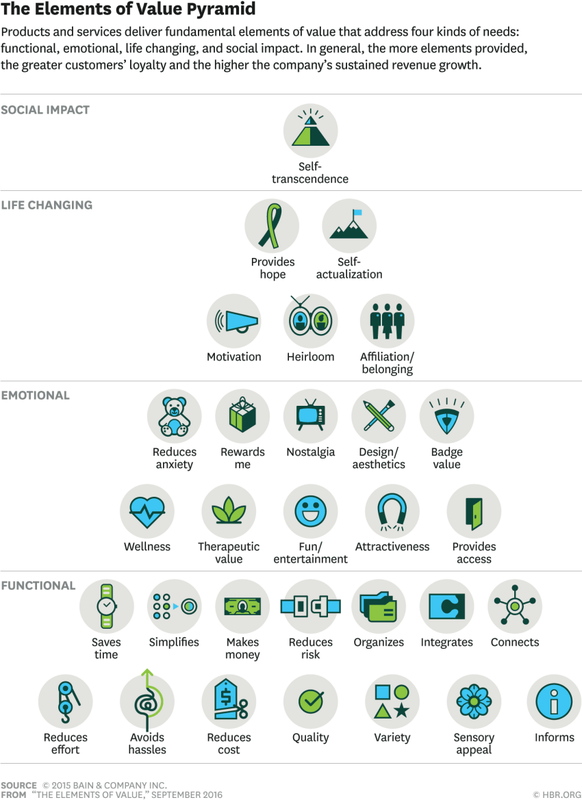 Eric Almquist, a partner at Bain & Company in their Customer Strategy & Marketing Practice, has extended Maslow’s Hierarchy to consumers and the value they perceive from a product or service. The Almquist Value Pyramid can easily be applied to chapters and their ability to meet members’ needs. Social Impact elements, which contains the element of self-transcendence. According to Almquist’s research, the more elements an organization can meet, the greater its ability to create engagement and loyalty. Some elements address internal needs, like motivation and hope, while others address external needs, like saving time and connecting. How well they’re meeting those needs. How can you apply the pyramid to your chapter? First, survey your members to learn the elements that are important to them. Find out if they are internally or externally motivated. Do they want more affiliation and belonging, or fun/entertainment and connection, for example? Then, break down your benefits into their individual elements. And finally, compare the elements your members want against the elements that make up the benefits you offer. How’d you do? Where are the gaps? With this level of detail, you can adjust your offerings to provide more of the elements your members are looking for. That may mean adding more chances to socialize, if your members are looking for connection and affiliation/belonging, or more advocacy opportunities, if your members want hope, self-actualization or self-transcendence. Chapters need to improve their ability to match benefits to members true needs. Just because you offer 25 benefits, doesn’t mean they care about all 25, or anywhere near that number. More than likely, they only care about a few. It’s time to find out how well you’re meeting members’ needs at the elemental level. Provide benefits containing the ones they want, and there’s a better chance they’ll stick around for the long-term.